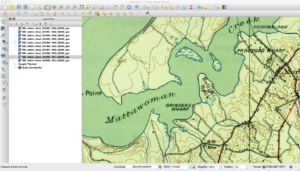 In part one I discussed how I go about finding and downloading maps from the USGS Historic Topomap site. 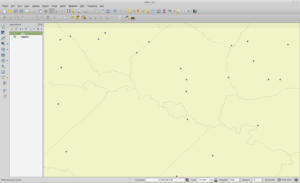 Now I will show how I go through the images I downloaded in Part 1 and determine which ones to keep to make a merged state map. I will also show some things you may run into while making such a map. 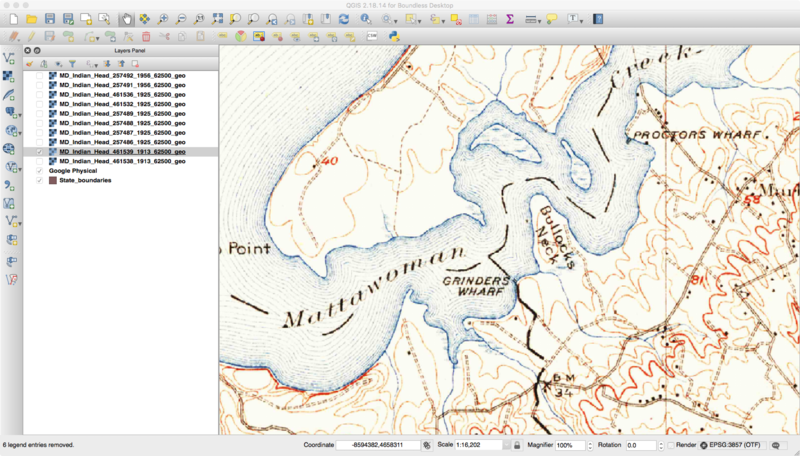 Now that the maps are all downloaded, it is time to go through and examine each one to determine what to keep and what to digitally “throw out.” When you download all the historic maps of a certain scale for a state, you will find that each geographic area may have multiple versions that cover it. You will also find that there are some specially made maps that go against the standard quadrangle area and naming convention. 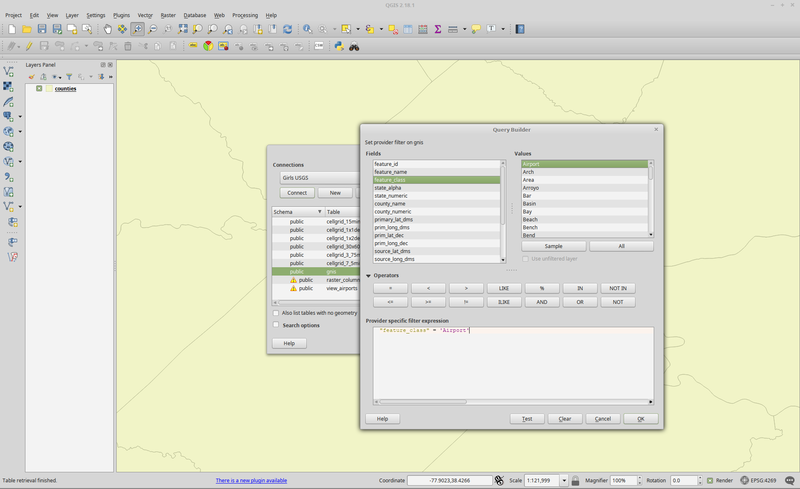 The easiest way for me to handle this is to load and examine all the maps inside QGIS. Oldest to cover an area. 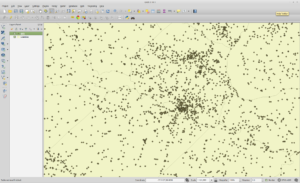 QGIS makes it easy to look at all the maps that cover an area. 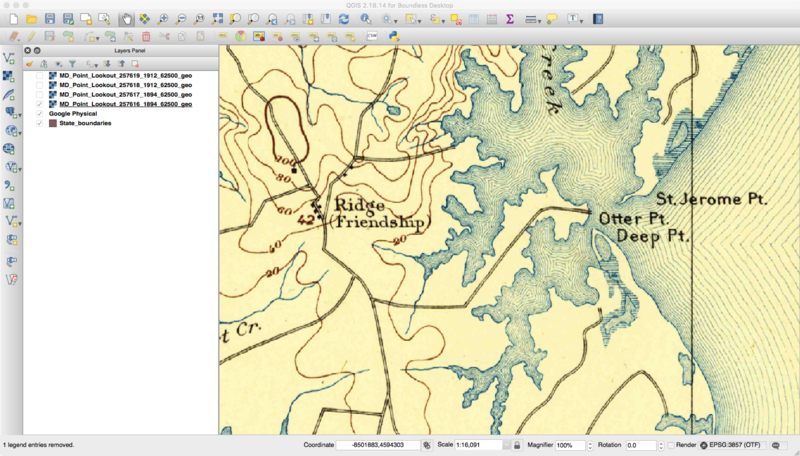 I will typically change the opacity of a layer and see how features such as rivers match existing ones. 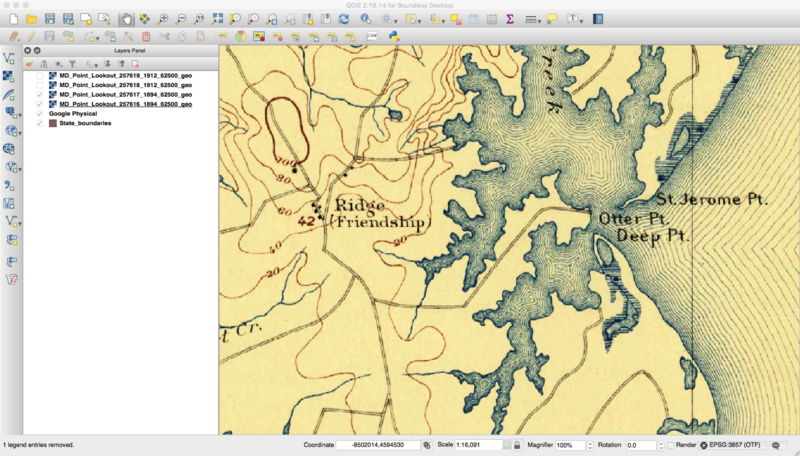 You will be hard-pressed to find an exact match as some scales are too coarse and these old maps will never match the precision of modern digital ones made from GPS. 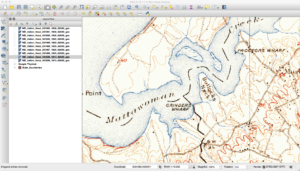 I also make sure that the map is not too dark and that the text is easily readable. One thing you will notice with the maps is that names change over time. An example of this is below, where in one map a feature is called Bullock’s Neck and in another it is Bullitt Neck. 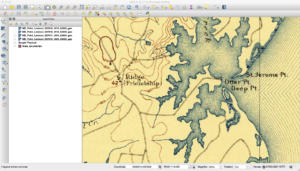 Another thing you will find with these maps is that the same features are not always in the same spots. Consider the next three images here that cover the same area. If you look closely, you will see that the land features of the map seem to move down between the second and third images. This happens due to how the maps were printed “back in the day.” The maps were broken down into separates where each separate (or plate) contained features of the same color. One contained roads, text, and houses, while another had features such as forests. These separates had stud holes in them so they could be held in place during the printing process. Each separate was inked and a piece of paper was run over each one. Over time these stud holes would get worn so the one or more would move around during printing. Additionally, maps back then were somewhat “works of art,” and could differ between who did the inscribing. 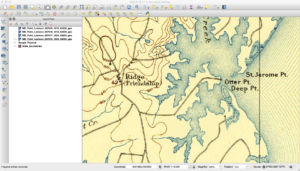 Finally, depending on scale and quality of the map, the algorithms to georeference the scanned images can result in rubber sheeting that can further change things. 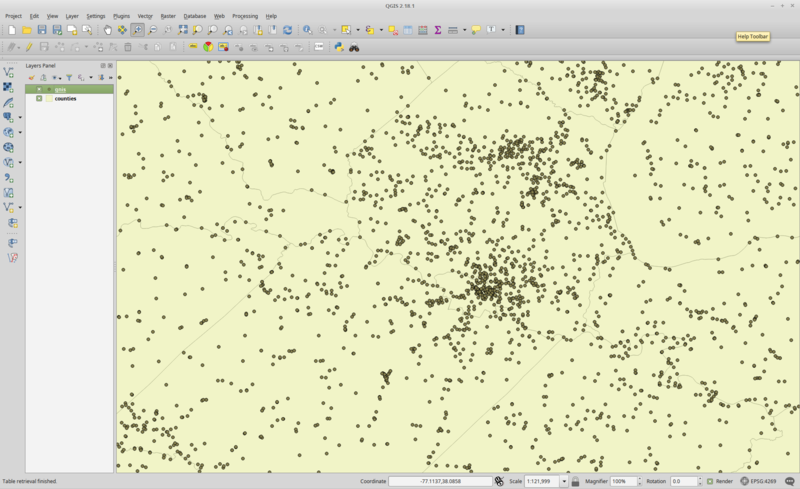 During my processing, one of the things I use QGIS for is to check which maps register better against modern features. It takes a while using this method but in the end I am typically much happier about the final quality than if I just picked one from each batch at random. Another thing to check with the historic maps is coverage. Sometimes the map may say it covers a part of the state when it does not. Here the map showed up in the results list for Virginia, but you can see that the Virginia portion is blank and it actually only contains map information for Maryland. Finally, you may well find that you do not have images that cover the entire state you are interested in. 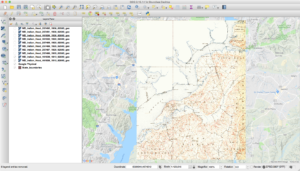 If you group things by scale and year, the USGS may no longer have the original topomaps for some areas. It could also be that no maps were actually produced for those areas. 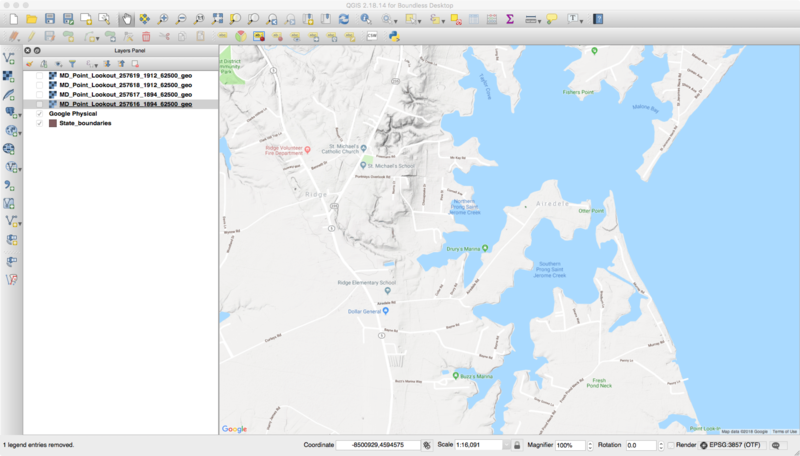 Once the images are all selected, the images need to be merged into a single map for an individual state. 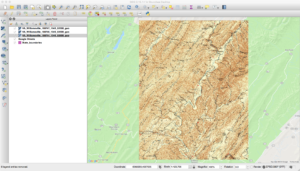 For my setup I have found that things are easier and faster if I merge them into a GeoTIFF with multiple zoom layers as opposed to storing in PostGIS. This command may take some time based on various factors. Once finished, the next part is to compress and tile the image. Tiling breaks the image into various parts that can be separately accessed and displayed without having to process the rest of the image. Compression can make a huge difference in file sizes. I did some experimenting and found that a JPEG compression quality of eighty strikes a good balance between being visually pleasing and reducing file size. 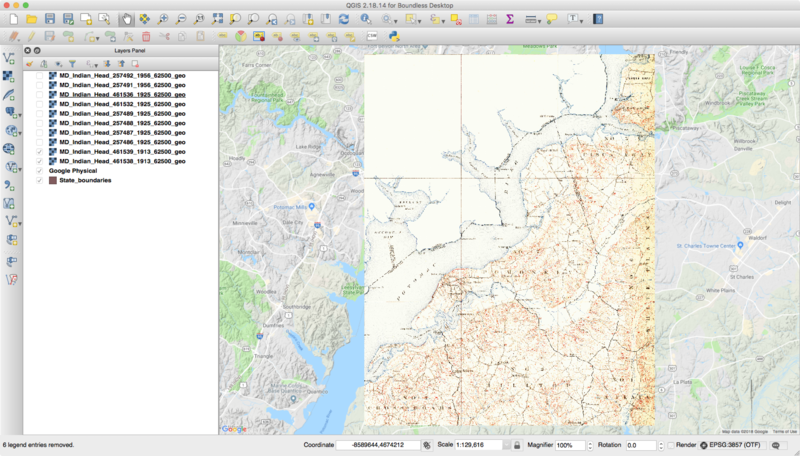 Finally, GeoTIFFs can have reduced-resolution overview layers added to them. The TIFF format supports multiple pages in a file as one of the original uses was to store faxes. 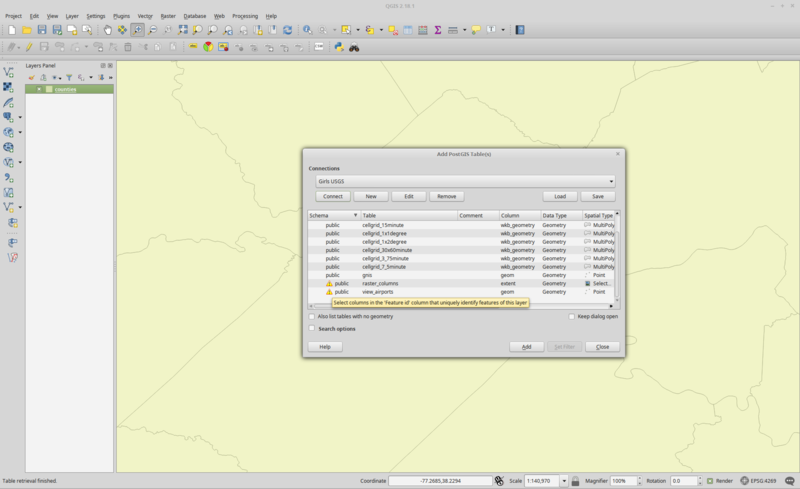 A GIS such as QGIS can recognize when a file has overlay views added and will use them first based on how far the user has zoomed. These views usually have much fewer data than the full file and can be quickly accessed and displayed. 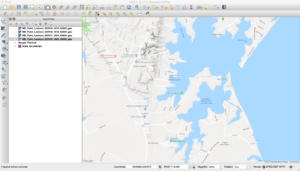 With the above command, GDAL will add an overview that is roughly half sized, quarter sized, and so on. 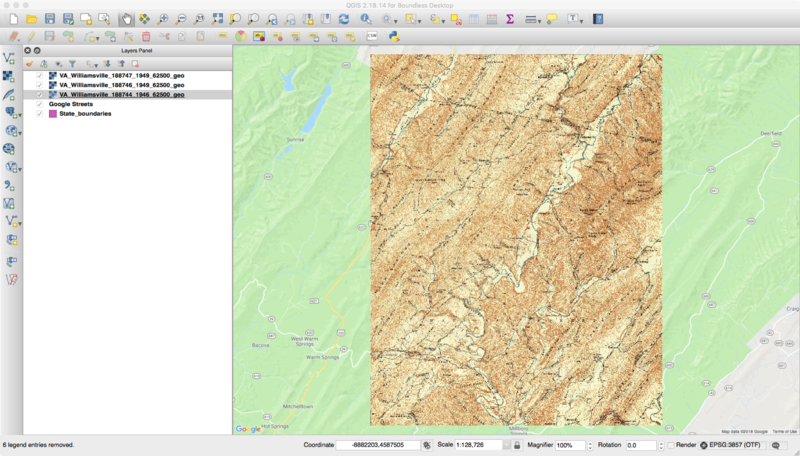 In the end, with tiling and compression, my 250K scale merged map of Virginia comes in at 520 megabytes. 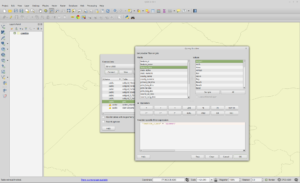 QGIS recognizes that the multiple TIFF pages are the various overviews and over my home network loading and zooming is nearly instantaneous. Hopefully these posts will help you to create your own mosaics of historic or even more modern maps. I’ve updated my datasets to the 2018 release of the Census Tiger Data. You can find them here. A while back I picked up a Raspberry Pi 3 and turned it into a NAS and LAMP stack server (Apache, PostgreSQL, Mysql, PostGIS, and so on). Later I came across forums mentioning a new entry from Asus into this space called the Tinkerboard. Now I’m not going to go into an in-depth review since you can find those all over the Internet. However, I do want to mention a few things I’ve found and done that are very helpful. I like the board since it’s supports things like OpenCL and pound for pound is more powerful than the Pi 3. The two gig of RAM vs one with the Pi 3 makes it useful for more advanced processing. One thing to keep in mind is that the board is still “new” and has a growing community. As such there are going to be some pains, such as not having as big a community as the Pi ecosystem. But things do appear to be getting better, and so far it’s proven to be more capable and, in some cases, more stable than my Pi 3. So without much fanfare, here are my list of tips for using the Tinkerboard. You can find a lot more information online. Community – The Tinkerboard has a growing community of developers. My favorite forums are at the site run by Currys PC World. They’re active and you can find a lot of valuable information there. Package Management – Never, EVER, run apt-get dist-upgrade. Since it’s Debian, the usual apt-get update and apt-get upgrade are available. However, running dist-upgrade can cause you to loose hardware acceleration. OpenCL – One nice think about the Tinkerboard is that the Mali GPU has support for hardware-accelerated OpenCL. TinkerOS an incorrectly named directory in /etc/OpenCL which causes apps to not work by default. The quick fix is to change to /etc/OpenCL and run ln -s venders vendors. After doing this, tools like clinfo should properly pick up support. Driver updates – Asus is active on Github. At their rk-rootfs-build site there you can find updated drivers as they’re released. I recommend checking this site from time to time and downloading updated packages are they are released. Case – The Tinkerboard is the same size and mostly the same form-factor as the Raspberry Pi 3. I highly recommend you pick up a case with a built-in cooling fan since the board can get warm, even with the included heat sinks attached. You can follow this link and install Tensorflow for the Pi on the Tinkerboard. It’s currently not up-to-date, but much less annoying than building Tensorflow from scratch. SD Card – You would do well to follow my previous post about how to zero out a SD card before you format and install TinkerOS to it. This will save you a lot of time and pain. I will note that so far, my Tinkerboard holds up under heavy IO better than my Pi 3 does. I can do thinks like make -j 5 and it doesn’t lock up or corrupt the card. I’ll have more to say about this board later. So I have been meaning to finish up this series for a while now, but other things got in the way (which hopefully I can post on here soon). In the mean time, there are numerous tutorials on-line now about how to set a Pi up as a home file server, so I think I will defer to those instead of wasting more bits on the Internet. However, I would like to point out some things I have done that has resulted in my Pi setup being nice and stable. This will stop the file system from modifying itself each time a directory or file is accessed. As you can see from my fstab, I also have my RAID partition on the enclosure set to xfs and I use the nofail attribute. This is very important since your enclosure may not be fully spun up and ready by the time your Pi tries to mount it. If it’s not there, the Pi will hang (forever in my case since it will cause the kernel to panic). I could leave them running since I’ve lowered their memory requirements, but choose to only have things running on the Pi 3 whenever I need it to make sure I don’t run out of memory. You could edit their config files to change the location, but for me I have found it is easier to simply use soft links. Plus, since the servers are not set to start a boot, I do not have to worry about any errors every time the Pi restarts. The filtermaxseconds parameter tells recoll to stop indexing a file if the filter runs for a whole minute. The thrQSizes option has recoll use a single thread. While this makes it slower, it makes things run much better on the Pi while still allowing other services to run. If you want to run other services, keep in mind that if they do a lot of I/O, you should move them to your external drive and use a soft link to redirect like I did above. Doing so will help to greatly extend the life of your SD card and keep you from having to reimage it.